Many people who undertake nutritional balancing programs based on hair mineral analysis eliminate some excess copper from their bodies at some point in their healing program. This occurs because most people have a copper imbalance. It usually includes having excess biounavailable and unusable copper in the body. This must be removed as soon as possible. This removal process usually causes some symptoms that can be annoying and even scary in some cases. This article discusses copper elimination symptoms, and what can be done to minimize them. Some practitioners make the error of aiming an entire nutritional balancing program at removing copper. This is not nutritional balancing science. It is more like allopathic medicine or regular holistic medical care in that it is about symptom removal, and not balancing the entire body system. It does not work nearly as well, and it is not as safe. 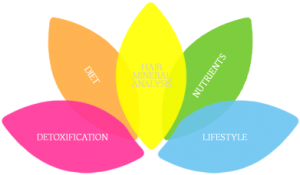 In almost all cases, a nutritional balancing program should aim to balance ALL of the body chemistry at once. When this is done, copper generally comes out in its own time in a gentle way, often with few symptoms. Occasionally, Dr. Paul Eck would focus on copper only, but we find this is almost never needed today because the nutritional balancing programs are much more precise and accurate than they were 15 years ago. These symptoms are temporary, but can be annoying and they cause some people to discontinue their nutritional balancing program when, in fact, it is working perfectly well. The rest of this article may help to explain the symptoms better and offer some ways to reduce their severity. Nutritional balancing uses at least one dozen mechanisms to cause the body to eliminate excess copper. Among these are balancing key mineral ratios and levels, making the body more yang, enhancing the organs of elimination, replenishing over three dozen vital nutrients the body requires, removing other toxic substances, reducing stress on the body caused by an improper diet, improper lifestyle and other factors, and the use of antagonists. Please note that nutritional balancing does not use chelators of any kind to remove copper to any extent. This is important. Although they will remove copper, they are not needed, they do not work as well, and they much less safe for several reasons. Copper chelators include penecillamine and some other products. Removing copper may sound like a simple idea, but it is not simple. Excess copper is quite poisonous for the body. It is mainly a powerful oxidant, but it has other toxic qualities as well, such as its effect on neurotransmitter synthesis and the properties of copper as an electrical conductor. The body may not be able to clear or remove it from the blood rapidly enough. Then this toxic substance is floating through the blood, essentially damaging everything it touches. The liver, kidneys or other eliminative organs absorb so much copper from the blood that they become overloaded and stop functioning properly. The liver is the usual place this occurs. In this case, the person will often feel nauseous, and perhaps will feel some pain or fullness in the area of the liver until the liver recovers. If a blood test were done, it might show slightly elevated liver enzymes, indicating some irritation of the liver is present. It is not hepatitis, which some doctors mistake it for. Taking a coffee enema is wonderful to help clear the copper from the liver in these cases. A temporary deficiency of the copper binding proteins occurs. To avoid toxicity, copper should always be wrapped up or bound to certain protein molecules in the blood and elsewhere. These are called copper binding proteins. These grab onto the free or unbound copper in the blood and safely transport it to the liver, kidneys and elsewhere. They include ceruloplasmin, metallothionein and perhaps others as well. Replacing copper with more healthful minerals in some enzyme binding sites may also cause symptoms. For example, in men, copper lodged in the testicles must be replaced with zinc, manganese or other vital minerals. This replacement process may also cause symptoms such as temporary testicular pain. In women, the replacement process alters the hormone balance. Until it rebalances, women can experience all sorts of menstrual changes for a few hours, days or even months. Die-off reactions related to the death of yeast or candida albicans infection in the intestines or anywhere in the body. This was discussed above. Die-off or even a flare-up of an infection that was “hiding” near a deposit of copper or in some other way related to copper toxicity. Copper toxicity is associated with infections of all kinds. As copper is eliminated, many people experience a temporary flare-up of symptoms related to a cold, flu, sinus condition, or some other infection. Drink 3 quarts or more of steam distilled water for a few days to a week as your only beverage. If you are drinking spring water or filtered tap water, switch temporarily to steam distilled water and no other beverage, and drink up to 4 quarts daily. This can be most helpful to reduce stress on the liver and kidneys, and allows the body to move through the copper elimination as quickly and as easily as possible. It may be possible to slow down the elimination by stopping or reducing the supplement program, and perhaps even changing the diet to add more animal protein and fewer cooked vegetables. This should slow all metal elimination. It is also easy to do and often effective, though not always. Once the process of a copper elimination has begun, the body often carries it through to completion. However, stopping the supplements and even the diet for a day or two may be helpful. Enhance the removal of copper from the blood stream by taking more coffee enemas, and maybe using more short (20-minute) sauna sessions. Longer sauna sessions would not be helpful, as they tend to dredge up more copper to be eliminated. More coffee enemas are often wonderful for copper elimination symptoms. They stimulate bile flow and enhance liver detoxification. They also keep the colon clean to help avoid toxin reabsorption. A person can safely take one or even two or three coffee enemas in 24 hours. The procedure for coffee enemas is at Coffee Enemas. Rubbing the feet, also called foot reflexology, is often helpful to alleviate symptoms of copper elimination. This can be done by yourself at home, or by a family member. Some professionals also offer it. To do it properly, obtain a foot reflexology chart or use the one on this website by clicking on foot chart. Do the entire foot, but also focus on areas that are related to your symptom such as the head if you have a headache. Short sauna therapy sessions or perhaps therapeutic massage may enhance circulation and help decongest the internal organs. The infrared light sauna will give the best results and may be used up to four or even five times a day for no more than 20 minutes at a time. Sauna therapy powerfully inhibits the sympathetic nervous system. This will enhance liver and kidney activity. It also enhances eliminative organ activity and one can sweat out some copper through the skin. Short saunas are usually better during a copper elimination because longer saunas can dig out more toxins, which may not be beneficial during a copper elimination. · Add milk thistle, dandelion or perhaps burdock root to promote liver activity. The best supplements of these are usually the tinctures. · Add Renamide, a kidney formula with 200 mg of kidney glandular and a few herbs for the kidneys. –More GB-3. This product contains ox bile, pancreatin and dehydrocholic acid that enhance bile flow. It also contains Russian black radish, a source of sulfur, which is a powerful copper antagonist. By enhancing liver activity, it can increase the rate of copper elimination by the liver. An adult dosage is one to three tablets three times a day with meals. Too much will cause diarrhea. –Vitamin B6 (pyridoxine or pyridoxal-5-phosphate). This is another copper antagonist that may be helpful during a copper elimination. One can take up to 1000 mg daily for up to a week. –Moly-Cu, from Endomet Labs. This product contains 100 mcg of molybdenum that binds with copper to reduce its toxic effects. It also helps the liver eliminate copper. However, molybdenum is slightly toxic, so it is not a preferred method to deal with copper elimination. The product also contains Russian black radish, an herb high in sulfur. Sulfur also binds with copper, reducing its toxic effects. Sulfur is also important for liver detoxification. The product also contains parsley, an herb helpful for the kidneys. An adult dosage is three to six tablets daily as needed. Molybdenum is more likely to be helpful if one’s hair sodium/potassium ratio is low. Hair must not be washed at the laboratory for accurate readings. –Zinc. While zinc is a major copper antagonist, taking more zinc during a copper elimination can cause the body to remove more copper from the liver. Zinc can replace copper in the liver and elsewhere. However, this might force more copper into the blood stream, aggravating copper elimination symptoms. Therefore, extra zinc is not usually the best answer. –Vitamin C. Vitamin C is an excellent copper chelator, but by stimulating adrenal activity may cause more copper to be dumped into the blood stream. A good chiropractic adjustment, if needed, may clear nerve blockages that may be interfering with the activity of the liver and kidneys. A much stronger immune response. This means a much lower chance of infections, cancer and other problems. Much better mental and emotional functioning. This means less tendency for anxiety, depression, mood swings, panic disorder, crying spells, seizures and even schizophrenia. Much better female organ activity. This means less tendency for premenstrual tension, endometriosis, ovarian and uterine tumors, and more regular and better menstrual periods. Other benefits: much better energy, better skin, hair and nails, less risk of heart and artery disease, a more normal blood pressure, and less risk of all liver disease. If you are a mother or mother-to-be, another benefit of lowering your excess copper is a much reduced chance of post-partum depression, morning sickness and problems in your babies. These include a lower risk of birth defects, delayed development, ADD, ADHD, autism, ear infections and many other common childhood problems. Also, your baby will often be born with less excess copper. High copper in babies is a serious concern today and very common. It is associated with problems ranging from birth defects and ear infections to attention deficit disorder, autism and other important health conditions. Copper elimination symptoms are temporary and disappear as the copper level decreases and the organs of elimination function better. Staying on your nutritional balancing program is worth a little temporary discomfort in order to achieve and maintain excellent health.